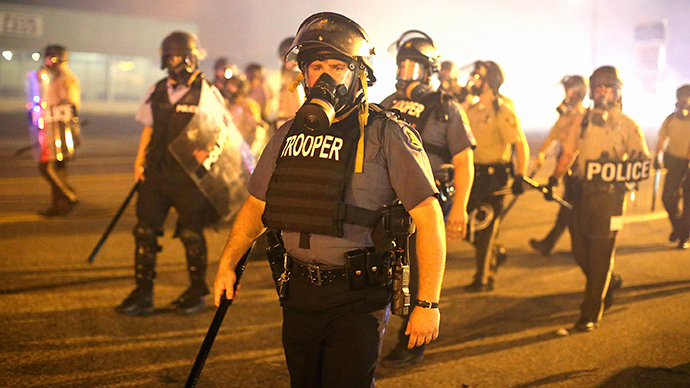 So-called less-than-lethal munitions used on protesters in Ferguson have become not only a symbol of a militarized mindset among law enforcement in the US, but have galvanized bonds between struggles against state aggression, from Missouri to Palestine. 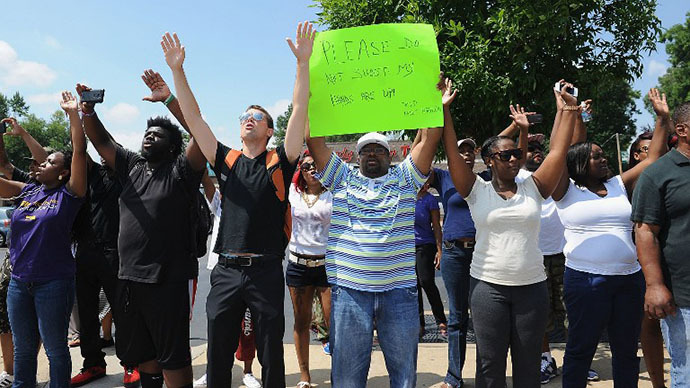 Protests over the killing of unarmed black teenager Michael Brown on August 9 by a police officer continued into their ninth day on Monday night, as police used tear gas to disperse protesters clustered in large groups. Live ammo was shot in one altercation, with two people injured. Authorities originally reported that 31 people were arrested in all that evening, but NBC News has since put that figure at 78, including two journalists. Tactics and ammunition used by area police and Missouri National Guard forces against Ferguson protesters - as well as bystanders and journalists - have come under deep scrutiny, as RT has previously reported. The heavy-handed response to civil unrest highlights the overall trend amid the “wars” on terror and drugs in previous decades to arm local police departments with the fruits of the military-industrial complex. 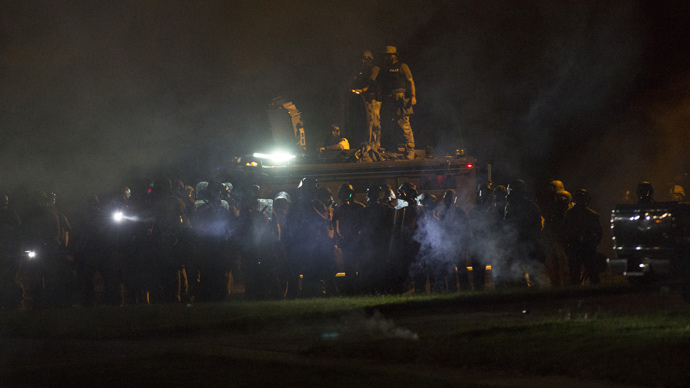 In Ferguson, those on ground have been subject to the use of tear gas, armored vehicles, rubber bullets packaged in cluster grenades, flash bangs, smoke bombs, sound cannons known as Long Range Acoustic Devices, bean bag guns, pepper spray, wooden batons, the presence of German shepherds, the issuance of a no-fly zone over the area and darkness aided by night vision goggles, not to mention other violent threats made with firearms. "It is a tragedy that as a clergy person I need a tear gas mask more than I need a collar to be able to do the work that I feel called to do," said Rev. Osagyefo Sekou, a pastor from the First Baptist Church in Jamaica Plain, Massachusetts, who was sent to Ferguson by the Fellowship of Reconciliation, according to Democracy Now. 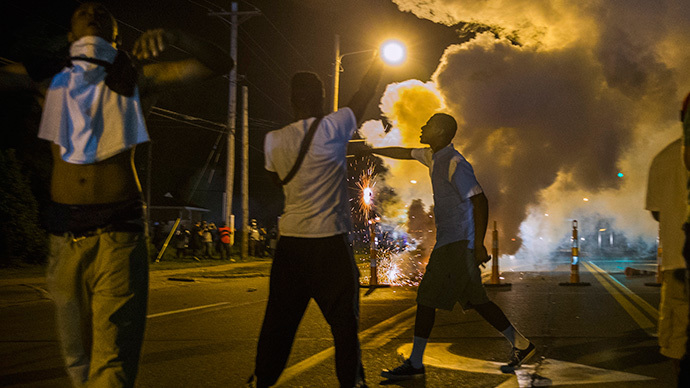 Citizens, activists, and journalists have chronicled much of the weaponry - including Cold War-era riot grenades - used by state forces in Ferguson. Manufacturers of these munitions have come under fire, as well. Activist Mariam Barghouti pointed out that the same makers of tear gas canisters being fired at Palestinians by Israeli forces have also supplied Missouri authorities. 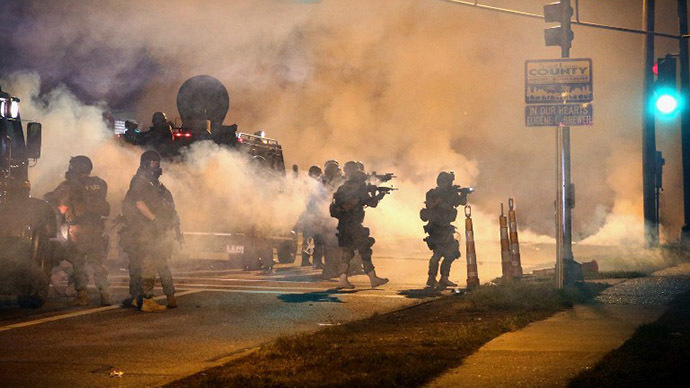 All of the gas fired by the county this week in Ferguson has been Combined Tactical. The state's supplier contract ended at midnight. YES! Magazine reported that the company is Combined Tactical Systems based in Pennsylvania. With American funding, the company has also supplied tear gas canisters to regimes in Bahrain and Egypt for use against protesters, according to Mondoweiss. 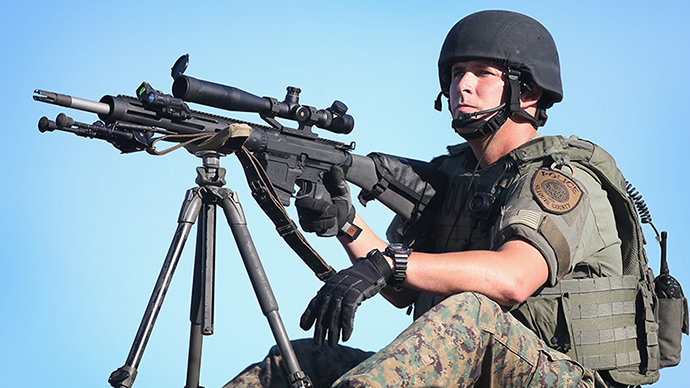 The St. Louis County Police Department is using Combined Systems munitions, according to Truthout, while the Ferguson police and Missouri State Highway Patrol have used products made by Defense Technology, a division of The Safariland Group. The two contractors are responsible for the bulk of 'less-than-lethal' ammunition used in Ferguson, according to the report. As it so happens, Combined Systems, Inc. and the Missouri State Highway Patrol, which is navigating state forces against angry and concerned citizens in Ferguson, are both scheduled to take part in the 73rd annual Military Police Expo to be held next month in Fort Leonard Wood, Missouri, hosted by the Military Police Regimental Association. Fort Leonard Wood is a major US military base and headquarters for the United States Army Military Police School. These munitions were on display Monday night, including during a live report from Ferguson by RT reporter Anastasia Churkina.